To me, there’s nothing like coming to the table and seeing a big, beautiful green salad that’s loaded with fresh, vibrant-hued seasonal ingredients. 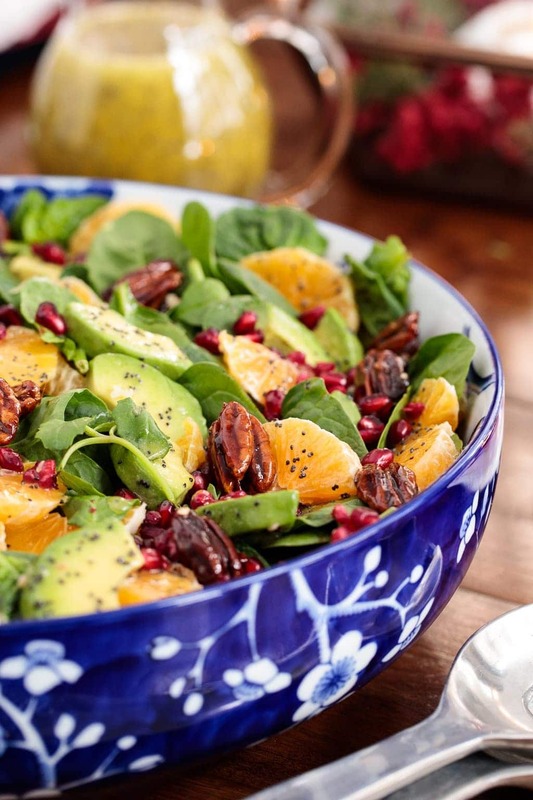 This Clementine Avocado Spinach Salad is all that – and more! 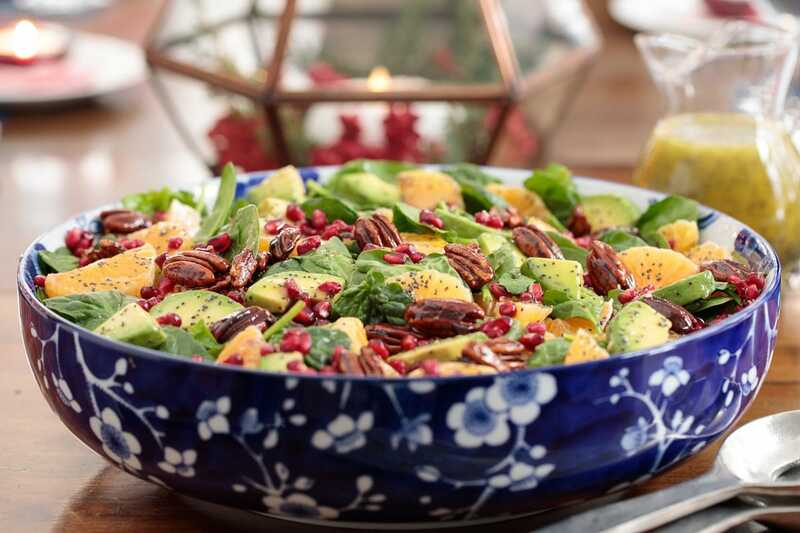 It starts with crisp, green spinach that’s tossed with sweet, juicy clementines, soft, velvety avocado slices and glistening, ruby-red pomegranate arils. This wonderful combination of ingredients is drizzled with a delicious Honey Poppyseed Dressing and finished off with a scattering of crunchy, irresistible Candied Pecans. See what I mean? All that, and more! This Clementine Avocado Spinach Salad is wonderful with grilled chicken and it goes well with a myriad of entrees. Try it with soup, grilled sandwiches or paninis as well as entrees like salmon, shrimp, pork tenderloin or whatever you’re planning for dinner tonight! I love that everything (except the avocado) can be prepped in advance and then thrown together at the last minute to create a healthy and delicious side or main course (with added protein). 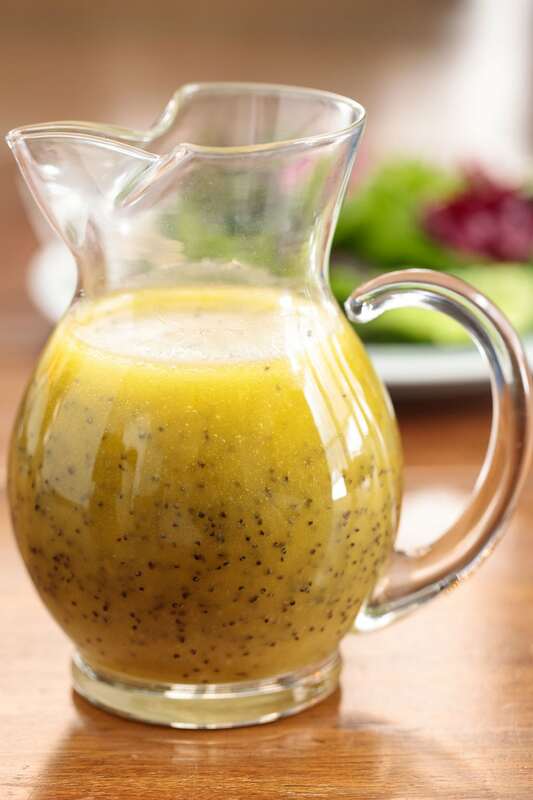 The Honey Poppyseed Dressing is one of those condiments that goes well with almost everything. I like to make a double batch and keep it stashed in the fridge. Then whenever we’re in the mood for a salad (almost always), I just combine a splash of it with whatever greens and other seasonal ingredients I have in the produce drawer. It’s wonderful with citrus of all varieties, apples, pears, cucumbers, grapes, and cabbage; as well as roasted squash and beets. The pecans? I wrote all about them in this post. They’re called Easy Candied Pecans because they take about 10 minutes to put together with ingredients you probably already have on hand. Check out the video below to see just how easy they are! You can use the Easy Candied Pecans in lots of other ways besides salads. 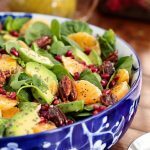 They add a delicious layer of flavor and crunchy texture to this Clementine Avocado Spinach Salad and make the salad look pretty as a picture! The crowning glory of this salad? A handful of ruby-red pomegranate arils. They look like little glistening jewels in this pretty salad. And if you’re a bit intimidate by pomegranates, no problem! We’ve done a super easy tutorial on how to remove the seeds from a pomegranate – in less than a minute. If you don’t believe it, read the comments below the post! Put all the ingredients together and you’ve got one delicious, beautiful salad; perfect for lunches, casual dinners or as a starting course for a dinner party! 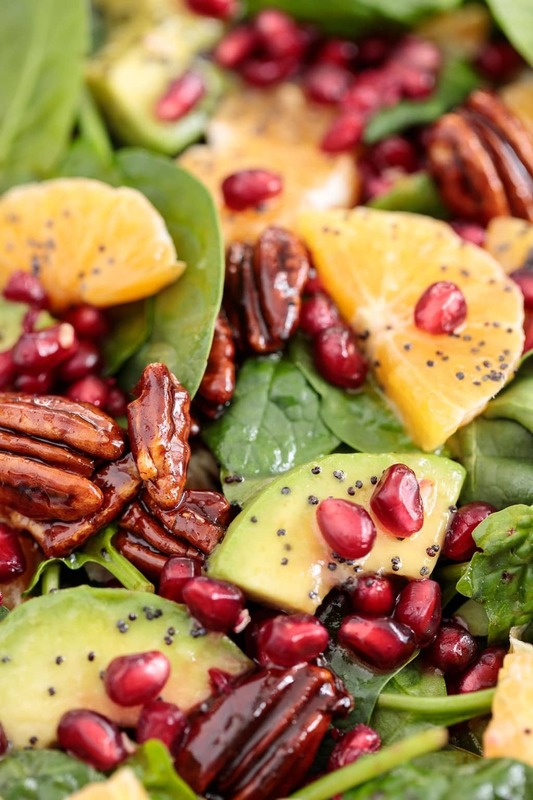 Make a batch of the Honey Poppyseed Dressing (below) and the Easy Candied Pecans today and you’ll have this Clementine Avocado Spinach Salad ready to roll in minutes! Look for a bag or packet of baby spinach that’s without wilted and/or wet leaves. If you see one or two wilted, wet leaves (kind of like the bad apple) pretty soon the whole bag/packet will be wet and slimy. If you can’t find pretty baby spinach, feel free to substitute baby arugula, baby kale, red lettuce or butter lettuce. Look for whatever is prettiest! This recipe includes a tablespoon of finely minced fresh ginger. I like to keep a tube of ginger paste in my freezer. It’s simply finely grated fresh ginger in a tube. I simply let it thaw for 10 minutes, squeeze out what I need and then pop it back in the freezer for next time. It’s a brilliant product that saves a lot of time and potential trips to the grocery store! I like the Gourmet Garden Ginger Paste (available in the produce section of many larger grocers, including Walmart) but Trader Joes Ginger Stir In Paste is also wonderful. 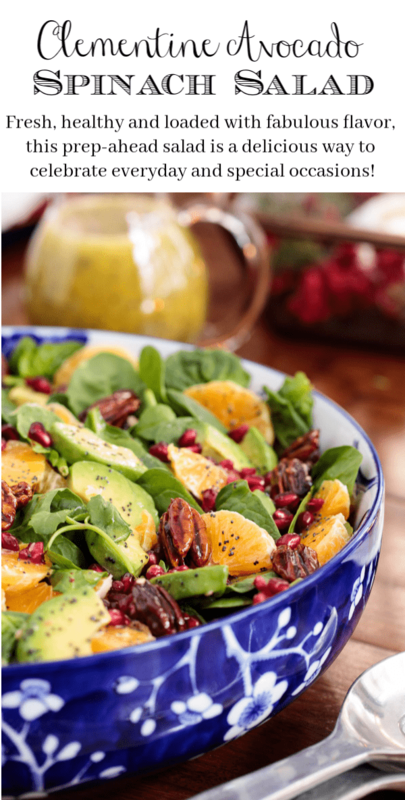 The Easy Candied Pecan recipe yields way more than you need for this Clementine Avocado Salad. You can easily half or quarter the ingredient amounts, but these little nibbles are so good you may want to make the whole recipe and use the remaining nuts for other salads, snacks and cocktail nibbles. They also keep well for a week to 10 days in an airtight storage container and can be frozen for several months. When choosing clementines look for firm fruit (no soft spots) that feels “heavy”. Heavier fruit will be juicier fruit. You can prep everything ahead for this salad except the avocados. 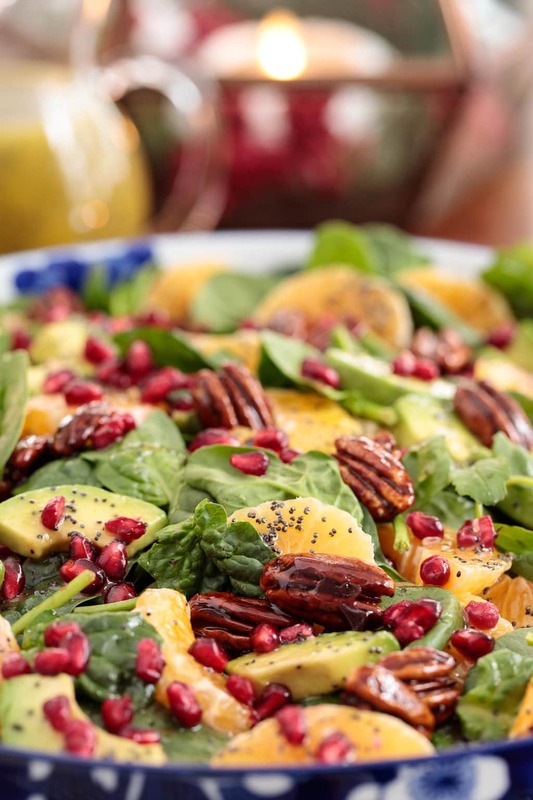 Keep the spinach, the sliced clementines, the pomegranate arils, the pecans and the dressing separate until just before serving. Then combine and add freshly sliced avocados. Did you know that poppy seeds can get rancid? That’s true, but if you store them in the freezer, they will keep for months. The great thing is that they’ll still be at your fingertips when you need them! Just pour out how much you need and pop them back in the freezer. The Honey Poppyseed Dressing makes more than you’ll need for this salad, but you can use it for lots of other salads so it’s wonderful to have on hand. I have made this recipe as written a number of times, in addition to using candied walnuts instead of pecans on occasion, and adding in a tiny bit of very thinly sliced red onion–I absolutely love this! Everyone I’ve served this to has loved it. I can’t tell you how exciting it is when I have leftover salad fixings to use up the dressing with. And I don’t share after day one! 😀 The pomegranate arils really make this dish stand out. I have had it as a complete meal several times, with leftover chicken or ham tossed in. I crave this stuff! I had a similar dressing recipe that I liked, but it called for sugar rather than honey, and it didn’t have the grated ginger or garlic. Those additions really make this a superior dressing. Thanks so much! Thank you, T.S., for such a detailed review. Sounds like you love this salad as much as we do! I know what you mean about the dressing. I made a double batch and have been using it on everything! I made this salad last night. It was delious. In fact I am making it again tonight, New Year’s Eve. Thank you and have a Happy New Year. Thanks for sharing your results, Karen. I love that you’re making it two nights in a row! We love this salad too! I’m making this salad for company tomorrow night. I’d like to prepare the dressing in advance (today) and refrigerate it until tomorrow. Do I need to be worried about letting raw garlic sit in the dressing overnight in the refrigerator? I’ve read that letting fresh garlic sit in olive oil can be a problem in terms of botulism, but I think one night in the refrigerator (with vinegar, too) is supposed to be okay. That’s a great question, Stacey. You don’t have to worry about the garlic in salad dressings as the acid in the vinegar or lemon juice will keep it safe. You can definitely make it today and serve it tomorrow! Such a beautiful salad and love the use of clementines, since I have a load of them around right now 🙂 Hope you and your family have a wonderful Christmas, Chris! Chris you mention a clove of garlic in the recipe. Does that need to be chopped up or do I just toss in a clove of garlic to the salad dressing. Thank you. Thanks for noticing that, Judy! I’ve amended the recipe. Merry Christmas! I’ve been in a salad rut and you’ve come to the rescue! I have avocados and clementines, so just have a few things to pick up! I could make a meal out of this gorgeous salad. Love all those nuts and bright clementines. Hope you and Scott have a wonderful Christmas! What a lovely and perfect salad!